Nitrogen is the primary pollutant of concern in Sarasota Bay. Algae growth in the Bay responds quickly to elevated concentrations of nitrogen. While some algae growth is normal in an estuary, uncontrolled growth leads to declines in water quality and can eventually cause reductions in seagrass habitats. In the late 1980s, wastewater discharges contributed more nitrogen to Sarasota Bay than any other source. With the consolidation of wastewater treatment into regional plants using advanced treatment procedures, nitrogen pollution to the Bay from wastewater was dramatically reduced. Today, with almost complete elimination of wastewater discharges to Sarasota Bay, the SBEP's water quality enhancement goals have shifted to reducing nitrogen pollution in stormwater runoff. Managing stormwater is vital to the restoration of Sarasota Bay. Some of the water that falls in the watershed reaches the Bay through the ground, but most of it is carried by creeks and streams via stormwater runoff. Without a stormwater system such as a swale or detention pond, stormwater runoff usually flows into the nearest water body without treatment. 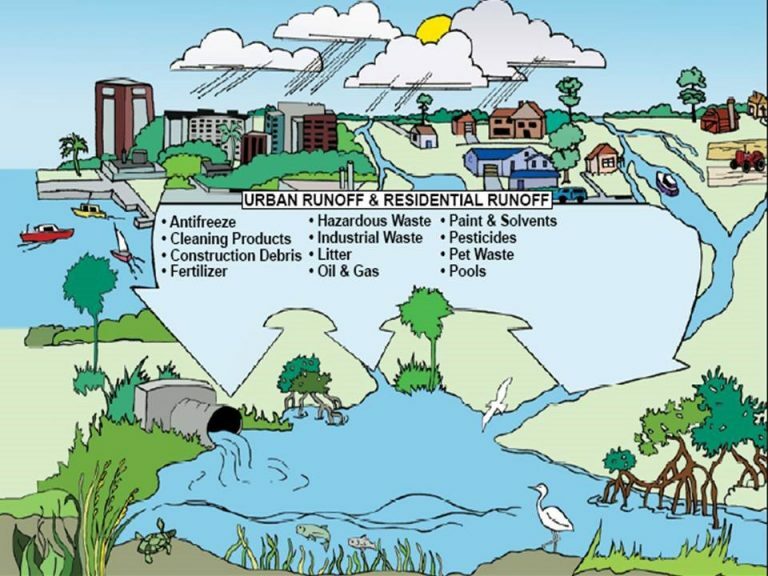 The runoff carries pollutants such as litter, motor oil, gasoline, fertilizers, pesticides, pet wastes, sediments and anything else that can float, dissolve or be swept away by moving water. The amount of stormwater pollution reaching the Bay has increased as the area’s population has grown. Development practices that harden and compact surfaces have caused a 50 percent increase in stormwater runoff flowing into the Bay. Low Impact Development (LID) is an environmentally sensitive approach to developing land and managing stormwater runoff through better integration of the built environment with the natural environment. Low Impact Development principles and practices allow a developed site to maintain its predevelopment watershed and ecological functions. Such design practices include saving trees on the site, installing cisterns to capture rainwater, using pervious surfaces, like bricks or shells, instead of impervious ones, creating green roofs, and planting Bay-Friendly landscapes. Changes in development philosophy related to site planning and preparation will help ensure that healthy, environmentally sensitive yards are created within the community. Such measures will likely include the preservation of natural vegetation, the use of contour swales, the aeration of soils before landscaping, the use of micro-irrigation, and the strategic use of turf. Red tides in Florida occur when microscopic algae, most commonly the species Karenia brevis, multiply to higher-than-normal concentrations. The algae produce a type of neurotoxin than is capable of harming fish, shellfish, and mammals (including humans). Red tide blooms have occurred for as long as humans have been documenting life along Florida's west coast. Researchers are working to better understand Florida red tide dynamics. At the present time, there is no practical way to control red tide blooms. More information is available in the 2007 report by the Mote Marine Policy Institute titled "An Assessment of Red Tide: Causes, Consequences, and Management Strategies." Help prevent water quality degradation from debris and discharges by reporting pollution to the appropriate authorities.